Late in 2003, What's Next released a box set of Champion Tops, a spin top and a yo-yo. These are "antiqued" recreations of collectible items from the 50's. Rights to the Champion name was secured by BC. 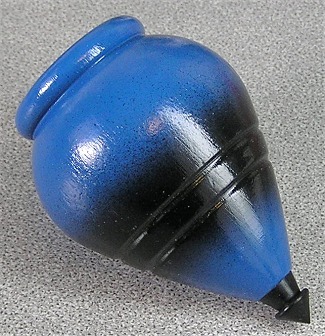 The Spin Top is a standard sized and shaped BC spin top, with plastic replaceable tip. The "not antiqued" versions were also sold separately, like the one here. Packaged in a poly bag with card. Pictured here is a blue Champion top. Notice the bottom of the logo, where the What's Next name appears.